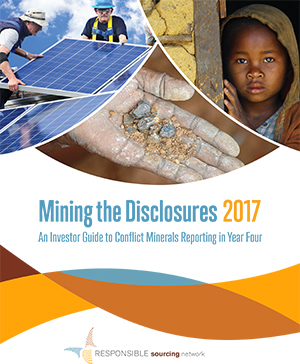 For the fourth consecutive year, RSN's Mining the Disclosures report analyzes companies' SEC conflict minerals filings following the requirements of Section 1502 of the Dodd-Frank Act. The 2017 edition dives deep into more than 200 high-profile companies, assessing 24 indicators from risk management capacities to reporting efforts and human rights impacts. For the first time, the report presents year-on-year comparisons per company, expanding stakeholder’s understanding of companies’ efforts to respond to supply chain and reputational risks. Don’t forget to check out our interactive rankings bar graph. Conflict in Eastern DRC remains one of the most salient humanitarian crises in the world, and minerals mined in the region continue to be used to illegally fund armed groups. However, working together with stakeholders, leading companies have been able to make progress and increase the number of conflict-free mines in the DRC. Companies must approach conflict minerals reporting as an opportunity to conduct comprehensive risk management on human rights issues, not simply check a compliance box. Source Intelligence® (SI) delivers supply chain transparency and compliance solutions that make it easy to engage suppliers and get compliant. SI's cloud-based platform helps clients make informed decisions about business partners to ensure their products meet legal, ethical, and environmental standards. The company's data collection, aggregation and analytics platform helps customers minimize supply chain and brand risk, and improve efficiency and communications. Founded in 2009 by career experts in environmental data and analytics, Source Intelligence® has headquarters in Carlsbad, California and operations worldwide. SI has received multiple awards, including the "GRC Innovation Award" by analyst firm GRC 20/20, "Most Promising Supply Chain Tech Solution Provider" by CIO Review and "Product of the Year" by Environmental Leader. Ropes & Gray has a leading Supply Chain Compliance and Corporate Social Responsibility practice. With team members in the United States, Europe and Asia, we are able to take a holistic, global approach to supply chain compliance and CSR. Senior members of the practice have advised on these matters for almost 30 years, enabling us to provide a long-term perspective that few firms can match. For further information on the practice, click here. Conflict-Free Sourcing Initiative (CFSI) has grown into one of the most utilized and respected resources for over 200 companies from a range of industries addressing conflict minerals issues in their supply chains. We offer a Conflict- Free Smelter Program, Conflict Minerals Reporting Template, Due Diligence Guidance, and Stakeholder engagement. We envision a future in which businesses can contribute positively to the fostering of peace and stability in the Great Lakes region. For more information, visit www.conflictfreesourcing.org. As You Sow is a nonprofit organization dedicated to increasing environmental and social corporate responsibility. Founded in 1992, As You Sow envisions a safe, just, and sustainable world in which environmental health and human rights are central to corporate decision making. Its Energy, Environmental Health, Waste, and Human Rights programs create positive, industry-wide change through corporate dialogue, shareholder advocacy, coalition building, and innovative legal strategies. For more information, visit www.asyousow.org.